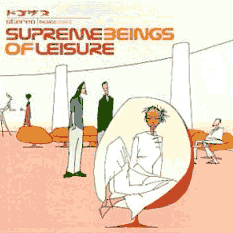 The Supreme Beings of Leisure debut has the distinction of being one of two albums that I’ve ever purchased after hearing less than a minute of music from it. The other is The Dandy Warhols Come Down. I bought it shortly after listening to snippets of a couple of songs at a Barnes & Noble kiosk. Incidentally, it’s entirely possible that themodernista sold the cd to me about six months before we officially met. For a time, I was enthusiastic about it and the record received a lot of play. That was five years ago. I can truthfully say that, despite the enthusiastic start, the album hasn’t aged very well. Perhaps it’s because it has this kind of big-budget Propellerheads-meets-Portishead slickness to it that comes across as formulaic. Like a Michael Bay film, the Beings produce a superficially appealing work that can’t help but come across as cold and calculated from the start. Granted, the album’s retro-lounge-spybreak sensibilities do sound good and the music is not unpleasant to listen to. I just can’t escape the feeling that each song was deliberately designed to be used as the establishing background music for trendy night clubs on TV or in as many commercials as possible. In the end, I think I’ll hang on to it (for a lark), but I won’t respect myself for it.